Philippine smartphone's price getting cheaper. For a low budget that you have, you can buy the new MyPhone Agua Rain 2G. A smartphone that a dual-core CPU with the latest android Jelly Bean 4.2.2 for only Php 1,988. As the list of specs above, there is no 3G Connectivity but this phone has a slow 2G internet access. If you want to download more apps on Google Playstore you better connect on a speedy Wi-Fi hotspot or network. But the limited 512MB internal storage cannot accomodate more downloadable apps, but thanks to the MicroSD card slot that supports up to 32GB. You can save and install on external MicroSD card the downloaded apps. 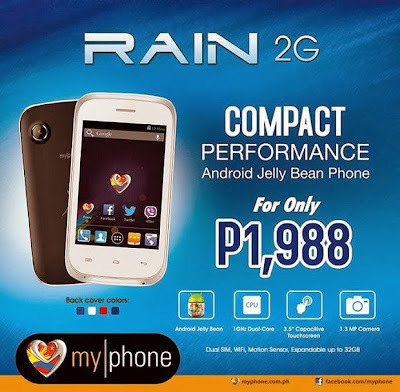 If the specs of Rain 2G is lack for you, just add an extra Php 1,000 and you can have in your hand the new MyPhone Agua Rain 3G. This 3G-capable smartphone has a better cameras and bigger internal storage and Ram. It's also have a built-in MyPhone apps known as Anti-theft technology (TARA) that remotely disable your phone to secure your data in case the phone gets stolen or lost.